A man under round-the-clock surveillance by an anti-terrorism task force was shot and killed Tuesday by a Boston police officer and FBI agent when he lunged at them with a menacing military knife, according to police. The shooting sparked an expanded investigation that quickly led to an arrest in Everett and a search in Rhode Island. Usaama Rahim, 26, had made threats against law enforcement, according to two law enforcement officials with knowledge of the case. Officials declined to explain what had led to the ongoing antiterrorism task force investigation or detail its scope, although they said it had been going on for a while. Rahim allegedly wielded the knife after being approached on Washington Street in Roslindale by task force members. Evans said the officers did not have their guns drawn when they approached. On Tuesday night, David Wright of Everett was arrested on federal charges in connection with the morning’s shooting, according to Christina DiIorio-Sterling, a spokeswoman for the US attorney’s office. Wright is expected to appear in US District Court in Boston Wednesday. Sterling declined to provide details of the charges, saying they would be filed Wednesday in court. Usaama Rahim allegedly planned to travel to another state to commit a beheading, but instead decided to murder officers in Mass. However, a law enforcement official with knowledge of the situation said the charges will relate to an alleged plot to kill a law enforcement member. Rahim is the brother of a well-known imam, who spoke out against terrorism after the Boston Marathon bombings. One woman who knew Usaama Rahim described him as a highly observant Muslim who married a young convert a couple of years ago. They attended the Islamic Society of Boston Cultural Center but stopped going, also about two years ago. They told her they thought the mosque was too liberal, said the woman, who requested anonymity to protect her privacy. Yusufi Vali, executive director of the Islamic Society of Boston center, said a company that provides security for the mosque hired Rahim for a month in mid-2013. He said Rahim did not pray regularly at the mosque, nor did he volunteer or hold any leadership positions. The woman said that although she sometimes disagreed with the couple on their religious views, they never said anything suggesting they supported violent extremism. She last spoke with them about two years ago, she said. Rahim also has no criminal record under his name, an official with knowledge of the case said. The encounter with Rahim, captured on surveillance video, began about 7 a.m. in the parking lot of a shopping center with a CVS and several fast-food restaurants, authorities said. Task force members approached Rahim to speak with him, according to Suffolk District Attorney Daniel F. Conley. They had a brief exchange near a bus stop, according to an official with knowledge of the investigation, before Rahim lunged with the knife. The weapon was more than a foot long with a nearly 8-inch blade, according to an evidence picture. Evans said task force members retreated and repeatedly ordered Rahim to drop his weapon. Officials said there were witnesses to the confrontation. The surveillance video shows task force members backing up before firing, the official with knowledge of the investigation said, and when they fired, Rahim was within 15 or 20 feet. The police officer and the FBI agent fired three shots, according to a police spokesman; two hit Rahim in the front of his torso. Rahim was pronounced dead at Brigham and Women’s Hospital. The officer and agent were taken to hospitals to be examined for stress. Tuesday’s confrontation marked the third time this year Boston police have been involved in the shooting of a suspect, including a March episode in which a gang unit officer was shot point-blank in the face and the assailant was killed by police. Vincent Lisi, special agent in charge of the FBI’s Boston office, would not disclose specifics of why Rahim was being investigated. “I can tell you that our investigation is still ongoing. There’s a lot more for us to do,” he said. He would not comment on the scope of the investigation but said he did not believe there was concern for public safety. Conley said his office would investigate to determine whether deadly force was justified. He stressed that no conclusion had been reached but said the surveillance video appeared to depict Rahim as the aggressor. Police officials hope the surveillance video will be released soon, a department spokesman said. But Conley’s office will make the final decision on when to release it, and spokesman Jake Wark said that decision will be made based on the circumstances of the investigation, including the pace and timing of witness interviews. “We want witness accounts to be based on memories and observations and not something they have seen on television,” he said. Officials said they plan to release the video to a limited number of clergy and civil rights leaders, possibly as soon as Wednesday. Investigators searched an apartment building on Blue Ledge Drive, near the scene of the shooting, though they declined to say how it was connected to the incident. 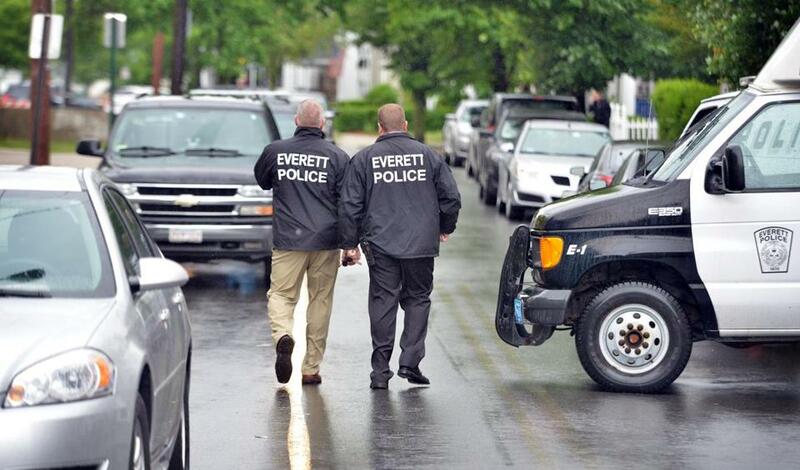 Everett police officers walked outside a house where FBI agents were investigating. In Everett, local police assisted the FBI with the investigation on Linden Street. The FBI and Rhode Island State Police also searched a property in Warwick, R.I., related to the shooting, according to a law enforcement official with knowledge of the investigation. Police sealed off Aspinet Drive, requiring residents to show identification before they were permitted to go onto the road, neighbors said. Nick, the teen said, often wears ankle-length robes and sometimes prays in his front yard. The teenager said he directed investigators to a pit in a wooded area near his house. “It’s just a pit with a couple tables and chicken wire surrounding it,” he said. A spokeswoman for the FBI’s Boston office declined to comment on the police activity on Aspinet Drive and would only say that the FBI and Rhode Island State Police were working a joint terrorism task force. Before officials publicly identified Rahim, his older brother, the well-known Imam Ibrahim Rahim, used social media to announce his younger brother’s death. The imam offered a version of the shooting at odds with the official version. He said his brother had been approached by three Boston officers, who shot him three times in the back. He said his brother had been waiting at a bus stop to go to his job and had called their father on his cellphone so he could witness the confrontation. “He was on his cellphone with my dear father during the confrontation needing a witness. His last words to my father who heard the shots were: ‘I can’t breathe!’ ’’ Rahim wrote. On Tuesday, Rahim posted on Facebook asking for privacy . Joan Vennochi: Can Suffolk DA be independent in the investigation? 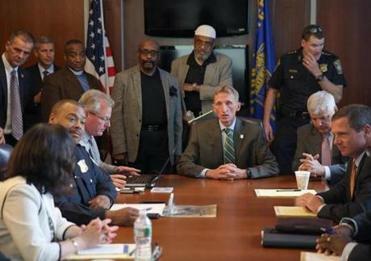 Plot is latest in series of terrorism cases with ties to Mass. Travis Andersen, John R. Ellement, Martin Finucane, and Shelley Murphy of the Globe staff, and Globe correspondent Astead Herndon contributed to this report. Evan Allen can be reached at evan.allen@globe.com. Follow her on Twitter @EvanMAllen. Laura Crimaldi can be reached at laura.crimaldi@globe.com. Follow her on Twitter @lauracrimaldi. Lisa Wangsness can be reached at lisa.wangsness@globe.com.